-- Diane Sawyer Interview, November 2004. Front page story or access the .pdf here. Western North Carolina Woman Magazine, October 2004. To read article, click here. Western North Carolina Woman Magazine, April 2004. To read article, click here. 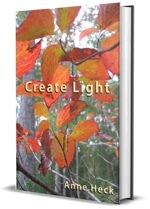 Create Light ~ a book of poetry inspired in the dark hours of morning that emerged in 2004-5. Click here to purchase. Sophie Magazine, April 2013. To read article, click here .